Who doesn't love a good IKEA hack. Especially one just in time to get those houseplants upgraded into bigger pots. We teamed up with Jill Hodges from Milk House 24 by Vintage Vogue Furnishings and Chris Israel to create an easy weekend DIY for you that will instantly upgrade your houseplant pots with a little bit of brush work and your leftover milk paint. Step One: Get your supplies ready. We used our favorite IKEA terracotta plant pot INGEFARA. Grab your brushes, Milk Paint powder (we used Miss Mustard Seed Milk Paint in Schloss and Ironstone), and water. Step 2: Combine your Milk Paint Powder and water. Then froth it up. 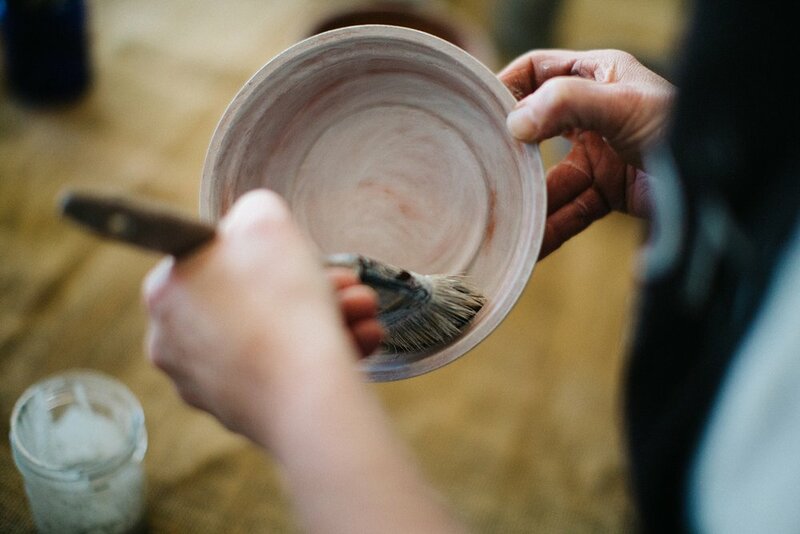 Step 3: Brush your mixed paint on both the saucer and the pot. Step 4: Let them dry for a few minutes. Step 5: Use some sandpaper to smooth your surface down and bring out some of the terracotta orange color. Then apply a little more paint. You can do this step a couple of times if you feel like it. Paint. Dry. Sand. Repeat until you have the combination you love. You may want to paint about 1" of the interior from the rim down of the pot. We chose not to as we are utilizing ODLA Growing media on top of our soil so we wouldn't be seeing the inner rim once our plant is potted. As always....having fun with a DIY is part of what makes the process so enjoyable. Chris and Jill's Miss Mustard Seed Milk Painted IKEA INGEFARA Plant pots with saucer once they are dry. Step 6 (Optional): You may want to give the interior of your pots and interior of your saucers a quick spray with Thompson Water Seal. This will water proof the inside of the pot. Unfortunately you'll no longer get the added benefit that porous terra-cotta provides by letting your plants draw excess moisture out of the pot. However it will preserve the beauty of your milk painted pots. If you choose not to use the Thompson Water Seal you need to let your pots 'cure' for 30 days before getting them wet. Also...if you want to use this technique on your outdoor patio pots you can be we recommend that you spray the outside of your pots with a light coat as well.